One way vision material is typically applied for indoor and outdoor signage and wide-format digital printing such as vechile advertising, irregular planes, and outdoor durable signage and product labels, especially for one way vision windows films. Made by glossy snow white surface and opacity black back calendared vinyl film. 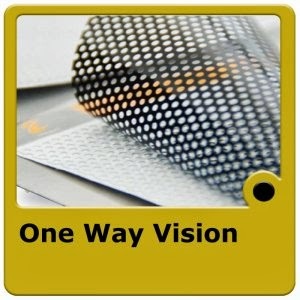 Perforated Vinyl material consistency for image quality & more accurate colors in digital printing. Regularity round holes and holes' distance make window graphic beatiful. Excellent weather resistant make perforated vinyl film suit for various area and environment in the world. Vutek, Scitex, Nur, Dgi, Salasa, Teckwin, Vutek, Nur, Scitex, Arizona, Salasa, Roland, Mimaki, Motuh, Teckwin, Yaselan, Flora, Infiniti, etc.